The operational version of the United States Geological Survey one-minute Dst index (a global geomagnetic disturbance-intensity index for scientific studies and definition of space-weather effects) uses either four- or three-station input (including Honolulu, Hawaii; San Juan, Puerto Rico; Hermanus, South Africa; and Kakioka, Japan; or Honolulu, San Juan and Guam) and a method based on the U.S. Geological Survey definitive Dst index, in which Dst is more rigorously calculated. The method uses a combination of time-domain techniques and frequency-space filtering to produce the disturbance time series at an individual observatory. The operational output is compared to the U.S. Geological Survey one-minute Dst index (definitive version) and to the Kyoto (Japan) Final Dst to show that the U.S. Geological Survey operational output matches both definitive indices well. 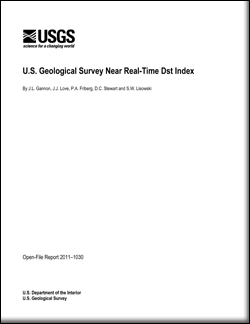 Gannon, J.L., Love, J.J., Friberg, P.A., Stewart, D.C., and Lisowski, S.W., 2011, U.S. Geological Survey Near Real-Time Dst Index: U.S. Geological Survey Open-File Report 2011–1030, 10 p.